This trip we stayed at the Vintners Inn in Santa Rosa. This is a convenient area on the Sonoma side. We loved this location and the Inn was very beautiful. The John Ash & Co restaurant is on the property and it also has a great bar. We had planned our Saturday starting with an early lunch at Bouchon in Yountville on the Napa side. We put the top down and took the scenic route over through Sonoma. It was a beautiful day! We arrived early at Bouchon and we were very glad that we had a reservation. I wasn’t sure if we needed one for lunch but it was a necessity. The restaurant is a lively french bistro. Their dinner menu is the same as their lunch menu so the prices are more inline with dinner offerings. We finished our lunch with “bouchons” or chocolate corks. It was a great dessert served warm with raspberry sorbet. Think warm chocolate brownies! After lunch, we headed to our first winery of the day: Plumpjack. This is a great small winery. Plumpjack is owned by former San Francisco Mayor Gavin Newsom and by Gordon Getty of the Getty Oil fortune. 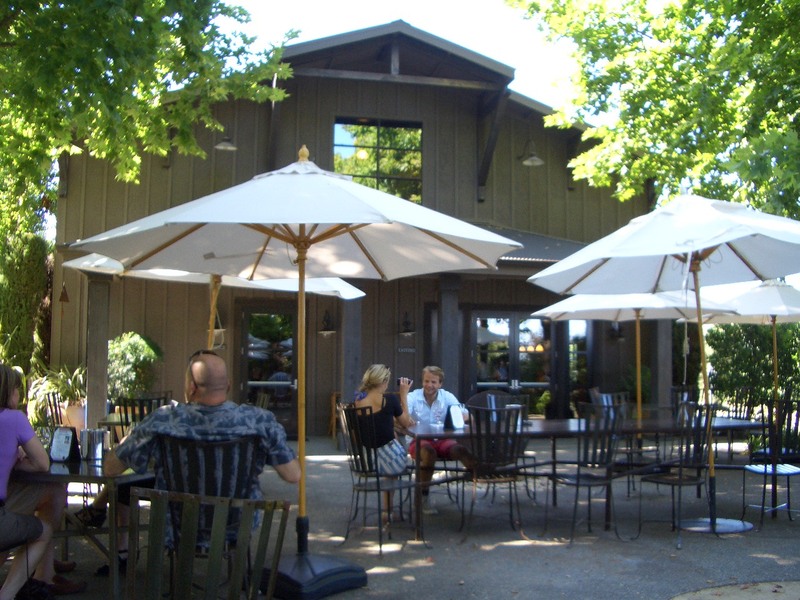 The winery is very approachable without a lot of the Napa snobbery that can be found in many places. Their cabs were wonderful. We had an excellent server that spent a lot of time with us explaining the wines. We always like to ask the servers where they like to go tasting on their day off. She recommended Miner Family Vineyards which was about a 1/2 mile from Plumpjack. Next stop Miner Family Vineyards! Unfortunately they had several large and loud parties that were there for tastings including a bachelorette group. So, it was a quick taste for us. I should mention here that we usually visit Napa during the off-season when the crowds are few and the tastings are really nice experiences. Ok, back to Miner. The standouts here were the Viognier and the Oracle. Wine Enthusiast awarded the 2007 Oracle 95 points. I would love to go back in the off-season. Honig Vineyard and Winery was our last stop of the day. This winery does require an appointment but we called and they were able to fit us in the last tasting of the day. They have a beautiful outside tasting room. It is a garden type setting with patio tables and umbrellas overlooking the vineyards. It was a very peaceful way to end our day. The tasting is not rushed and they encourage you to enjoy your time there. They pour an award-winning Sauvignon Blanc and a yummy Cab. Unfortunately we didn’t get to meet the Honig wine dog. Apparently wine dogs get the weekend off! Highly recommend a tasting at Honig on your next trip to Napa. Thanks so much for the nice comment about our winery. We are thrilled that you enjoyed your time with us. Sounds like your trip was a great one and we cant wait to have you come back. Next time make sure and visit our sister winery CADE on Howell Mtn. We will definitely be back and we also want to go to CADE as well. We can’t wait to enjoy our bottles of Syrah and Cabernet that we brought home. I have never been a huge fan of Syrah until I had yours!